WILMINGTON, N.C. – After two years of planning and much anticipation, New Hanover County Cape Fear Museum is set to open Friday, September 25, 2015. 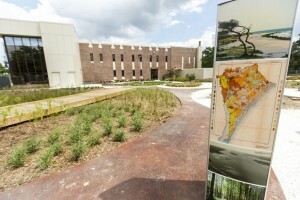 Located at the corner of Eighth and Market Streets adjacent to Cape Fear Museum, the community park will welcome visitors with engaging hands-on exhibits, gardens featuring native and adaptive plants, and educational programs while also serving as a place to enjoy and explore nature in the city. Join New Hanover County officials, Cape Fear Museum staff, board members and local leaders as the ribbon is cut and the Museum’s community park officially opens. Investigate hands-on exhibits, discover how the region’s land and water have shaped our history, and explore impacts to the natural landscape. Join Cape Fear Museum educators and community organizations in our new park for nature-related family fun! Explore the sights and sounds of the natural world, create a nature journal, and paint with water. Test your knowledge of native and non-native plants, read and record weather, operate a digger to “dredge” a channel, and experience a Ghost Forest. This program is in conjunction with Take a Child Outside (TACO) Week, a yearly nationwide initiative that encourages children and adults to spend time together exploring the natural world. Parental participation required. Get a private preview of New Hanover County Cape Fear Museum Park, hosted by Cape Fear Museum Associates, before it opens to the public! Explore the park and its interactive exhibits while enjoying live music and refreshments. Sponsored by Jack and Carol Mills, New Hanover Regional Medical Center, Time Warner Cable, the Law Office of Jeffrey W. Porter, SDI Construction, Stevens Fine Homes, Cunningham and Company, ECS, Ashley B. Garner and Associates, Southeastern Nephrology Associates, State Farm – Thomas Murphy, Samantha and Brett Dooies, Sheryl Kingery Mays, Amy and Eric Thornton, Kitty and Chris Yerkes and Ginger Fisk and Buck Youngblood. In 2006, residents of Wilmington and New Hanover County passed a bond referendum to expand parks, green space and cultural facilities throughout Wilmington, New Hanover County, and the beach towns. In 2008, the City of Wilmington sought community and citizen input on parks, recreation, and open space needs and priorities. Planning for the Museum’s park began in the fall of 2012 and local officials broke ground in March 2015.